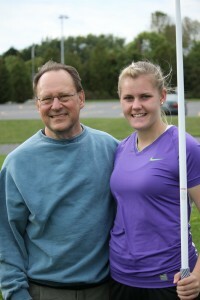 I am also throwing shot put and discus under the coaching of Darrin Reesal. Both coaches are with the Ottawa Lions Track and Field Club and they are both amazing. One year isn’t very long for throwing events and I really have no idea how far I will get with it I am enjoying learning the new sport and just having lots of fun 🙂 It’s hard sometimes when I compare my results to the ones I have in Taekwon-Do. I have to remind myself that I’ve been doing TKD all my life so there shouldn’t be any comparison. I always worry that the coaches will get disappointed if I don’t progress fast enough. The track coaches are all volunteers so I really do appreciate every bit of time they give. Bill always keeps journals on EVERYTHING which is something that we have in common 🙂 This blog is my journal. It’s fun to look back over the year and see what we went through together and I’m looking forward to more success this year. Thanks Bill for sharing all your wisdom.